Have you made your New Year Resolutions and intentions for 2019? The start of a new calendar year is the best reason to start tweaking your health and happiness. It gets dark very early these days in Central Europe and this definitely does affect our mood. Not only do we get less Vitamin D these days but cold and flu season hits and can take a toll on those who aren’t taking proper care of themselves. With some mindful changes you can still feel the best version of yourself, and escape the flue virus. With some simple hacks you will be on the sav(er) and healthier side 😉 For a stronger and happier self! Especially during winter time we shouldn’t underestimate the importance of vitamins. Often we tend to eat rather cooked and probably less fresh food. Sometimes it might be good to take multivitamins. Not only do vitamins strengthen your immune system, but they also promote cell growth and regulate your metabolism. For me citrus fruits like oranges and tangerines are THE favorite fruits and perfectly in season during the cold months. But sometimes I don’t fancy peeling nor caring around whole fruits with me. And what is better than convenience and freshness in one? You got me – cold pressed juices, especially the healthiest ones from Michel are my super boost juices. Still depending where you live (and don’t get much sunlight these days) – vitamin D insufficiency is common and therefore a supplement is not too bad. Sleep has many benefits and is the key to a healthy lifestyle. If you don’t get enough sleep, it will impact you not only physically but also mentally. You also want to make sure you get enough sleep because lack of sleep makes your body more prone to germs and other viruses. Without enough sleep you won’t be able to fully enjoy all the exciting activities during winter time. For me it is definitely easier to get to bed when it gets dark earlier. Because during summer time I stay up so late. It can be challenging to maintain a proper diet when there are so many Christmas treats and left overs. And oftentimes during winter we get some extra holiday kilos and built winter fat storages. Therefore, not necessarily already getting into your bikini body but a healthy diet will help. Fresh fruits, juices and colorful food will make your mind and tummy happy. This does not mean you have to plan out full body workouts, but it’s a good idea to include a daily routine where you get your body moving! There are so many amazing sports you can do during winter time. If you are lucky and can enjoy the offerings of a winter sports destination – try some new and old sports. I used to do ski alpin for the last couple of years and still love it. But crosscountry skiing or snowshoe hiking are just a bit more demanding for your fitness and just hooked be. You should try them! Ice Skating is another beautiful activity you could do even in the city centers. Many locations have beautifully decorated ice fields and oftentimes you some stalls will offer you something to warm you up. If you are too scared or lazy for any of these activities – a simple walk outside in the fresh air will make you happy and your body will thank you the movement it gets. It’s always smart to carry hand sanitizer in your handbag. Think about all of the germs you’re exposed restaurants, in bathrooms — everywhere. While you are out shopping for supplies, pick up a bottle of hand sanitizer and a pack of sanitizing wipes. It’s a good idea to use sanitizer even when you think it isn’t necessary because you won’t realize just how many germs you come into contact with when out and about. Remaining healthy is more than possible if you use take care of yourself — vitamins, sleep, lots of water, good food, exercise and sanitation. Not only will these tips ensure your health, but they will make you feel happy and healthy. 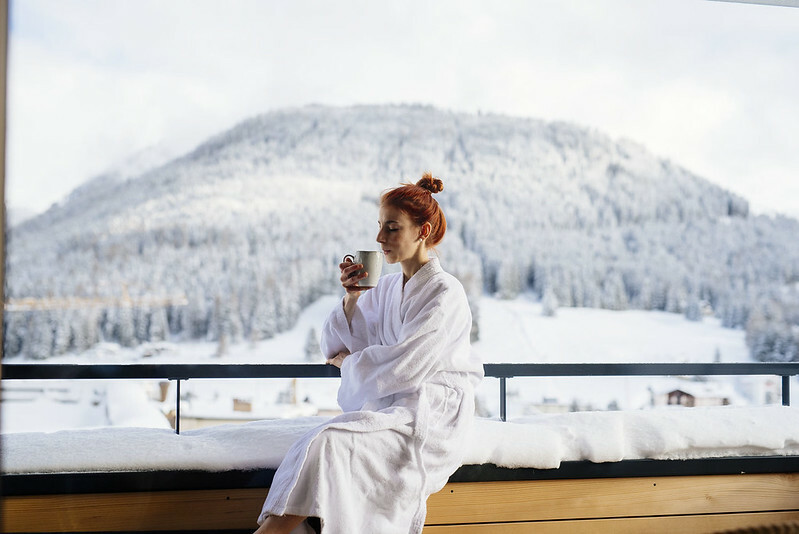 All the beautiful photos were taken in Davos and particularly the newly opened Parsenn Resort. *this article has been created in friendly collaboration with Michel – but all expressed opinions are my own.